Global electronics contract manufacturing services market expected to reach approximately USD 32.05 billion by 2025, at a CAGR of slightly above 8% between 2019 and 2025. Electronic contract manufacturing services is a model where an original equipment manufacturer (OEM) hires a company that looks for the core manufacturing facilities on behalf of the hiring firm. The report covers a forecast and an analysis of the electronics contract manufacturing services market on a global and regional level. The study provides historical data for 2016, 2017, and 2018 along with a forecast from 2019 to 2025 based on revenue (USD Billion). 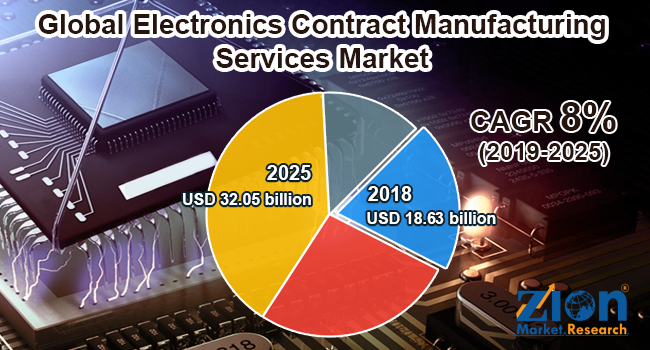 The study includes drivers and restraints for the electronics contract manufacturing services market along with the impact they have on the demand over the forecast period. Additionally, the report includes the study of opportunities available in the electronics contract manufacturing services market on a global level. The study provides a decisive view of the global electronics contract manufacturing services market based on process, application, and region. The process segment is divided into electronics design and engineering, electronics assembly and manufacturing, test engineering, and others (supply chain management services and rework services). The application segment is segmented into consumer electronics, automotive, aerospace and defense, medical and healthcare, telecommunications, and others. All the segments have been analyzed based on present and future trends and the market is estimated from 2019 to 2025. The regional segment includes North America, Europe, Asia Pacific, Latin America, and the Middle East and Africa. Some key participants operating in the global electronics contract manufacturing services market are Foxconn, Flex Ltd., Asteelflash, Pegatron, Celestica, Inc., Kimball International, Venture Corporation, Benchmark Electronics, Actia Group, Zollner Elektronik, Key Tronic EMS, Sanmina Corporation, and Jabil.